When shopping around for the perfect electric guitar, there are so many pieces of information for you to keep a lookout for in order to find the perfect match for your budget, your music style, and your experience level. If you don’t have a whole lot of experience shopping around for electric guitars (or maybe don’t know what to look for), shopping around and choosing your dream guitar can get really confusing. Today’s guide is going to go over in depth all of the aspects that you should go over before purchasing a guitar, so by the end of this guide, you should be left with enough confidence to rock your new electric guitar purchase! If you’re new to the world of guitar, chances are you don’t have too much of an understanding of what makes a guitar a good guitar. Just a tip for you to keep in mind, not all guitars are made equally; there are thousands of different guitars on the market for a good reason. Each guitar (whether it be acoustic or electric) have been made with a specific purpose for a specific group of musicians in mind. Shopping around for a guitar can be stressful, but in the long run, it’ll be a lot less stressful if you don’t purchase a cheap guitar or guitar kit at Walmart, Target, Amazon, or a toy store. It’s almost a guaranteed chance that the cheap guitars you purchase off of here are going to have problems with intonation and will be made with low quality materials, as not many beginners will be able to tell the difference between the cheap Amazon guitar they just bought and a high-quality guitar that’s worth the investment. Just do yourself a favor and don’t buy it, even it seems like a really great deal. I totally agree that starter parks are great to have around if you’re not really sure if you’re going to stick playing the guitar. Starter kits typically have everything that you need to get started playing the guitar (metronome, tuner, capo, extra strings) but the guitars that come with the starter kits aren’t typically of very high quality. Save yourself the trouble and don’t buy yourself a guitar that you spotted at Target or Walmart, even if the price is super cheap. Be careful about the guitars that you’re buying off of Amazon too, just as long as you’re staying away from no-name brand beginner guitar kits. Who you are you shopping around for? If you’re reading over this section, chances are you’re shopping around for a beginner. When looking into buying a guitar for a beginner, it’s important that you observe the sizing of the guitar that you’re interested in purchasing, just as you pay attention to the style of the guitar that you’re purchasing (ensuring that it matches up with the new musician’s taste in music they’re looking to play). Purchasing an electric guitar that fits into the aspirations of the newbie guitarist can help to ensure that the new musician will stay motivated to learn and play their new instrument. Shopping around for an electric guitar for a child means that you should be shopping around for a guitar that is described at ¾, travel, or mini, as these guitars are smaller than the average electric guitar, which means that they’re the perfect size for small or young musicians. However, if you’re shopping around for an older teen or an adult that is of average size, you won’t want to purchase a guitar that says mini, travel, or ¾. 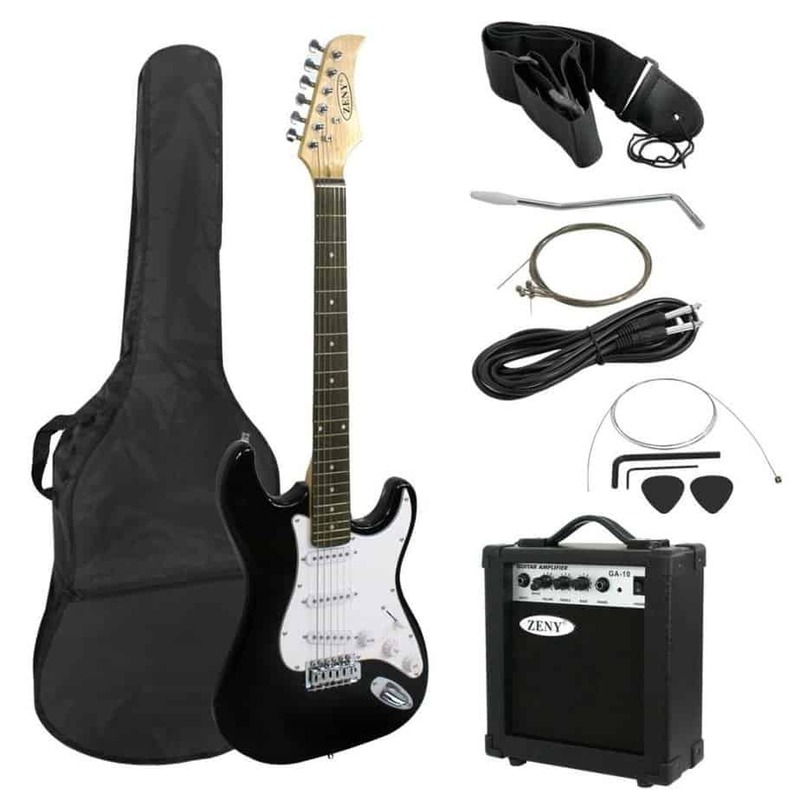 Shopping for a beginning guitarist means that you need to find an electric guitar that not only stays in tune, but is easy to play, as well as have a comfortable body style, high-quality electronics, and fit within the music style that you’re beginning guitarist is aspiring to play in. If the person that you’re shopping around for has a favorite guitarist, take a look at the instrument and genre that this guitarist plays in, so you have a better idea of what type of music your new musician is looking to play. This will help point you in the right direction of what type of guitar to buy! If you’re on the hunt for a new guitar for the experienced guitarist in your life, your shopping journey is probably going to be a lot easier. Most likely, they will have a specific guitar that they’ve been eyeing up for a while. If they aren’t exactly sure what type of new guitar they would like, purchasing a popular model from a famous brand won’t steer you wrong. However, if you want to go with something a little more unique, take some time to do some research and find what people are saying about the lesser known brands that offer revolutionary electric guitars. When you are shopping around to buy a guitar, just keep in mind that when you see a high price tag on a guitar, you’re usually investing in the quality of an instrument. It’s always better to have a little bit of cushion room in your budget when shopping around for a new guitar, as you may find that you want to spend a little more than you were expecting for the perfect guitar that you weren’t expecting to find. In the long run, if you purchase a high-end, high-quality guitar up front, you’ll end up saving money in the long run, as you won’t have to worry about upgrading your instrument. With the more experience that your guitarist has, the more likely they are to want an expensive, high-end model. If you’re getting ready to invest some serious cash into a new guitar for your experienced guitarist, it’s better to sit them down and talk to them about the guitar that you’re looking at purchasing, so you can find out what type/make/model they’re exactly looking for. At the end of all of your hunting and researching, the pricing of your guitar is going to be the deciding factor between your top two choices. If you’re out shopping for a beginner, you may be a little worried about spending too much money on an instrument, especially if you don’t know if the guitarist is going to stick with the instrument. Don’t feel guilty, as it’s totally understandable to feel this way, but you should also know that there are plenty of electric guitars out there that are of amazing quality, for just about any budget that you have. But at the same point, keep in mind that the nicer the guitar the new player starts off with, the more likely they are to keep up with learning and playing the guitar. Trying to learn on an instrument that’s extremely hard to tune or is really hard to play isn’t the best tool to start learning the guitar on, possibly deterring a new musician. How much should you be spending on a guitar? This is probably the most important question when shopping for a guitar! A lot of people know that guitars are very expensive, but not a whole lot of people have an understanding of how much money they should be spending on a guitar. Spending $300 or less on a beginning player isn’t going to limit the options that are out there for a good quality beginner guitar. Epiphone is a well-known brand that offers a great selection of beginner guitar packs for less than $300. These packs usually come with everything that you need to start playing the guitar, but I know there are also some other brands out there that will include lesson books, lesson DVDs, and other resources to get the new player started on the right track in their beginner kits. Just as a quick note, if you decide that you want to purchase both an amplifier and a guitar, you should be spending more on your guitar than you do on your amplifier (unless you’re looking to upgrade to a higher quality guitar, in which case chances are you aren’t a beginner). A guitar that you invest in will last with you for a long time, through all of your musical growth. A beginner level amplifier will be perfect for at home or lesson practice sessions. You can always upgrade your amp at a later date, which won’t be as expensive as buying a brand new guitar. The larger your budget is, the more choices are going to be readily available to you. Most of the guitars that you find in this price range are going to be upgrades of the guitars that sit in the $300 price range. You will notice an overall better quality in the tone wood used, the physical appearance of the instrument, the hardware used, and the electronics used. This will have an overall impact on your sound and the playability of the guitar, but the differences won’t be as drastic as they are with the next price tier. There are countless high-quality electric guitars that will cost you upwards of a $1000. You should only be investing this type of money in a guitar if you are a guitarist that has been playing for a while and are interested in buying a guitar that matches your skills, but will also continue to grow with you throughout your lifelong relationship with guitar, whether that be on a personal or performance level. Whether you’re shopping around for yourself or you’re looking to give an electric guitar to the new musician in your life, it’s very important that you do a lot of research before committing to a purchase (especially if you’ve never bought a guitar before). If you’re using this article as a main point of research before buying, here are a few extra tips that I wanted to share with you to make your buying experience a little easier. If you’re really nervous to make a move, ask a luthier to help you pick your guitar or for their opinions on the guitar that you’re interested in buying. A luthier is also known as a guitar repairman, so they usually have a ton of knowledge on different types of guitars and the quality of those said guitars. I would highly recommend asking a luthier for guitar advice over a guitar salesman, as a guitar salesman could possibly get kickback from selling you a specific guitar model. On the other hand, a luthier doesn’t receive any sort of commission for trying to sell you a specific guitar, which means that their answers and advice are going to be more reliable. Make sure to work on setting your budget before you start shopping around for a guitar. With all of the different accessories that are out there for you, it’s very easy to get quickly lost in spending tons of money on cool gadgets and gear. Create a budget before you start shopping for anything, that way you know what you’re actually comfortable spending instead of guessing what the final price tag is going to be after every ‘add to cart’ click. If you’re having a hard time feeling like you’re not very successful with playing guitar, don’t believe everyone who is telling you that you need to invest in a better guitar to sound like a better musician. A better guitar does not equal a better player; practicing on a consistent basis is what’s going to make you a better musician! As mentioned earlier, if you see a really cheap guitar at Walmart or Target, don’t fall into the trap. There is a reason that the guitar is that cheap, don’t let the low price tag fool you! The same thing applies for Amazon and eBay, as these sites are notorious for selling non-name brand guitars for really cheap, dragging in a lot of beginners who don’t know anything about a quality guitar, but are drawn to the low price tag of a guitar and a starter kit! Just because you’re buying a name brand guitar doesn’t mean that you’re buying a quality guitar. Most name brand guitar manufacturers have some really amazing guitars out there, but at the same point, they also have some flops on the market too. Don’t buy a guitar simply because it’s from a name brand. Research the guitar and if possible, stop by your local guitar shop or music store to play on it for a little bit before committing to a purchase. When testing out your guitar at music shop or a guitar store, ask an employee if they have any amps available for you to use to test out the guitar you’re playing. That way you’ll have a better idea of how the sound of your guitar pairs with certain amps (if you don’t have any experience) or how the guitar sounds with your favorite amp (if you’re an experienced guitarist). If you’ve decided to purchase an amplifier with your electric guitar, don’t forget to buy a cable! You need a guitar cable to be able to connect your guitar to your amplifier and they’re typically less than $20. Doing research before committing to a purchase is important, but make sure that you don’t just trust the thoughts of one guitar blog or one reviewer. Everybody has the own perception of sound and their own idea of what makes a guitar a good guitar. If you’ve been able to narrow down your potential list to one guitar, go and read through five or more different reviews. This way you’ll get a better understanding of what this guitar does (and doesn’t) have to offer you, as told from different points of view. Even after researching and reading through reviews, I always stress that before buying your new guitar, go in store and get it in your hands. Spend a little while playing and seeing how the guitar feels in your hands before making a final decision. You don’t have to buy the guitar in store, especially if you found a better deal online, but at least by going in store and seeing how the guitar feels (and sounds) will give you a better grasp on what you’re investing in. How does an electric guitar work? Shopping around for an electric guitar if you have absolutely no idea how an electric guitar works can get extremely confusing, as there is a bunch of terminology that goes into describing what separates different makes, models, and styles. If you don’t have a basic understanding of what an electric guitar is and how it works, you are likely to assume that all electric guitars are the same. That isn’t true! While all electric guitars do operate on the same basic rule of thumb, all models and styles have different purposes. On an electric guitar, there is a pickup mounted on the body of the electric guitar and this pickup serves as a magnetic field. When you pluck or vibrate a metal string, the string creates a current. The current of that metal string is transferred by the pickup through a preamp circuit with tone controls, straight to the guitar cable. Your guitar’s amplifier boosts the signal and modifies the signal with a variety of effects and tone controls, all depending upon what type of design and the effects of your amplifier. This signal is sent out to a speaker, which converts the signal to sound waves. How many pickups, the types of pickups, the strings, the tone controls, the tone wood on your guitar, your playing technique, and several other factors all influence the signal that is sent out to your amplifier. In other words, every single aspect of your guitar will alter the overall sound that your instrument produces. What are the different body types? A solid body electric guitar is the most commonly found body in the world of electric guitars; a solid body is comprised from a solid piece of wood, so nothing too complex here. Solid body guitars are really universal and can different from single-pickup models, to a multi-pickup guitar, with all sorts of electronic options available. The biggest downside to using a solid body electric guitar is that you will find that solid bodies don’t have as much resonance as hollow-body models do. Hollow body guitars have bodies that are hollow, like an acoustic guitar has. Hollow body guitars have a lot of resonance because of their hollow bodies and are very popular in the jazz community, mainly because of their rich, full tones and responsive bass. The one thing about hollow body guitars that turn some people off is that hollow bodies are very prone to feedback. Lastly, semi-hollow body guitars are very similar to hollow body guitars and have a lot more resonance than solid body guitars do. What sets semi-hollow body guitars apart from hollow body guitars is that semi-hollow bodies have a wood block in the center of the body, which helps to add to the sustain and sound stability of the guitar, but also helps to cut back on the feedback that this guitar produces. Semi-hollow body guitars are popular amongst musicians of all genres, but especially blues and soft-rock players because of the warm and the increase attack that’s offered due to the middle block. The type of wood that your guitar is built with is called a ‘tone wood’; tone woods are a selection of woods that are known for producing an outstanding tone and a desirable sustain when paired up with an instrument. Each tone wood has different sound characteristics and qualities, which can be highlighter with the type of guitar that it’s used for. Below, I have a list of some of the most commonly found tone woods that are used in the creation of electric guitars. There are some guitars out there that may use a combination of two types of tone woods, which would alter the sound very drastically in comparison to if the guitar was to use a singular type of tone wood. Alder: Light weight wood with a tone that is known for being balanced. Ash: Open grain wood that produces a balanced tone, but known well for creating transparent finishes. Agathis: Has similar tonal characteristics to alder, but doesn’t produce as much resonance as alder does. Most commonly found on affordable guitars. Basswood: Light weight wood that produces a warm tone, accentuates middle tones. Korina: Medium weight wood, with a warm, sound that doesn’t accentuate high tones. Mahogany: Medium weight wood with a warm sound, produces wonderful sustain. Maple: Medium weight wood, with a bright sound, long sustain. 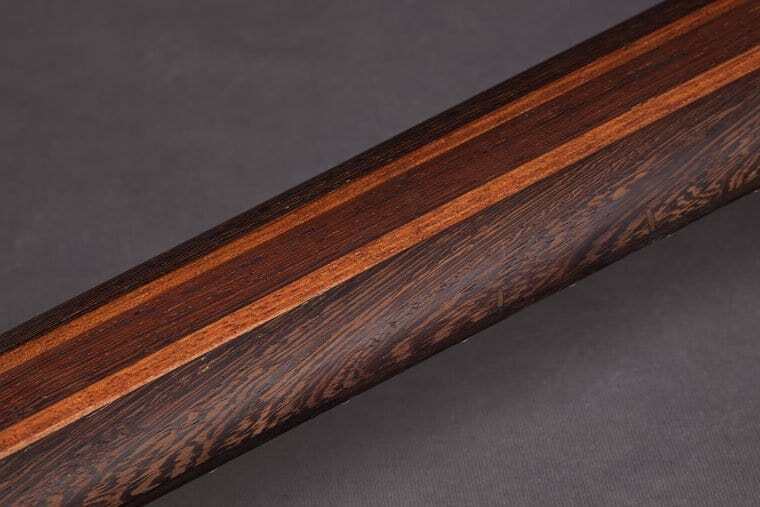 Nato: Nato is also referred to as ‘eastern mahogany’ and produces a warm resonance. This is a very strong wood and is commonly found on the necks of lower end guitars. Poplar: Light weight wood, produces a bright and crunchy sound. What are the different types of pickups? The style of the body of an electric guitar has the biggest influence over the sound that the guitar produces, but the pickups (and any electronics) featured on guitar are the second greatest way to affect the sound that a guitar produces. Single- coil pickup are the most basic pickup design that you’ll find on a guitar. A single-coil pickup is comprised of a singular magnet with a super fine wire wrapped around with, which creates a magnetic field that will catch the vibration from your strings, which will then convert the vibration into an electronic signal. 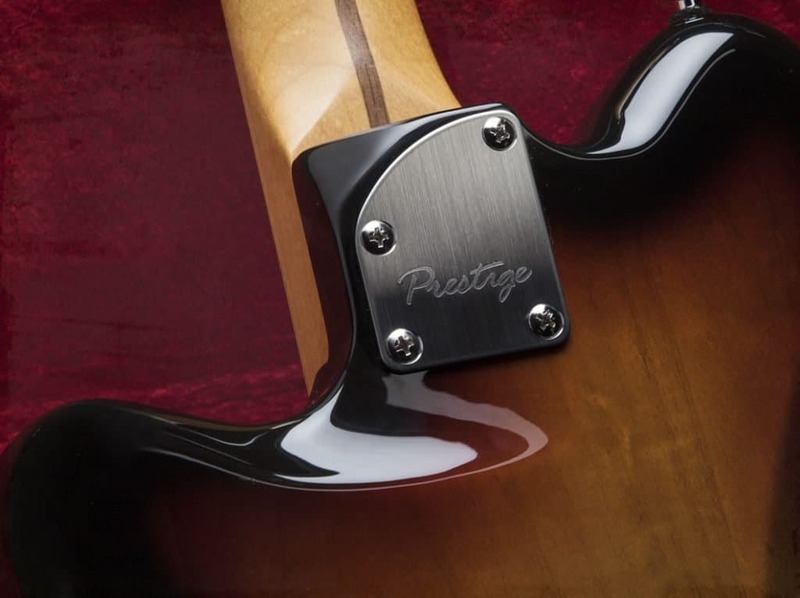 Single-coil pickups typically tend to have a crisp, bright sound, which is why they are a popular choice for musicians that are looking to cut through the dense sound that a band creates. The biggest downfall to using a single-coil pickup is that they tend to render a humming noise, but also have problems with magnetic interference. 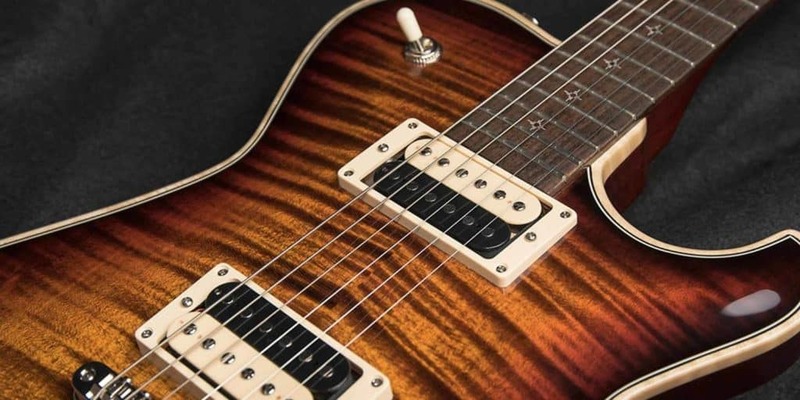 Humbucker pickups were brought into existence to deal with the humming noise that single-coil pickups produce, but now also offer musicians different tonal characteristics that go beyond the abilities of the single-coil pickup. Humbucker pickups have two single-coil pickups wound together, with the different polar magnets placed opposite of each other. By using polar opposite magnets, placed opposite of each other, the design of the humbucker pickup has been able to eliminate the hum that’s prone in the single-coil pickup. Humbucker pickups have a louder, larger, and more powerful tone when being compared to single-coil pickups. Humbuckers are pretty versatile, but are typically found in jazz, heavy metal, and rock music. Piezo pickups are the least popular type of pickup, so it’s going to be on a very rare occasion that you run into a guitar that has piezo pickups. There are crystalline seasons placed on the saddle of an electric guitar and the piezo sensors work by picking up the mechanical vibration, whereas single-coils and humbuckers work by using magnets to convert sound from vibration and converting it to an electrical current. Unlike single-coil and humbucker pickups, piezo pickups are sometimes used to activate synthesizer sounds, almost like an electric keyboard, but are most often used on electric guitars to simulate the sound of an acoustic guitar. It’s pretty common to find guitars with multiple pickups installed, some guitars with several single-coils, some with several humbuckers, some guitars with a combination of both humbuckers and single-coils. These different types of combinations really opens up the tonal range that you can have with your instrument, but the different pickup configurations can be identified with single letter abbreviations. Single-coil pickups will just be marked as “S” whereas humbucker pickups will be marked with an “H”. The identification of the placement for each pickup starts from the neck and moves down towards the bridge, so if you were to find a guitar with an ‘HSS’ configuration, the humbucker would be at the neck of the guitar, while the two single-coil pickups would be found at the middle and bridge positions. Where pickups are found on the body of your guitar can greatly impact the tone of your guitar. Pickups that are found around the bridge of the guitar will pick up on the treble sounds more than the bass, because the strings near the bridge have the least inclusive motion. However, pickups that are located on the neck or on the center of the strings will emphasize midrange and bass tones. Guitars that feature several pickups have control that allow the guitarist to individually adjust the pickup, as well as play around with the combinations of two or more pickups at the same time. These controls can be found in the form of a blade selector, rotary knobs, or toggle switches, which can also the musician to switch the pickup selections quickly during a live performance. Most guitars on the market are produced with passive pickups, but there are some guitars out there that have active pickups. Active pickups use batteries to be used as an energy source and use a preamp to help shape the sound that the instrument produces. Active electronics can sometimes also use filters and equalization circuits to be used for extra control of the sound. The terms ‘tuning pegs’, ‘tuning machines’, ‘tuners’, and ‘machine heads’ are synonymous, but are all referred to the mechanisms on the headstock of your guitar that hold your instrument’s strings in place. Tuning pegs allow musicians to tune their instrument by adjusting the tension on the strings; the stings are held in place on your guitar by being attached to posts, that are attached to knobs, which can be turned to regulate the string tension (which allows the guitar strings to be tuned). There are some tuning pegs on higher-end guitars that lock into place, which provides more tuning stability for the guitar, but also helps to prevent the strings from slipping loose. Locking tuning pegs also help to make changing your strings a lot easier, if that’s something that you absolutely hate doing. There are also some tuning pegs that lock down at both the bridge and nut, which keeps the stings from stretching too much or slipping when you’re using a tremolo. The purpose of a bridge is to ensure that despite varying string gauges, string lengths, or different metals used to create the strings, that all of the strings stay in tune with each other. Bridges allow for changes in the length of the strings to bring each string in tune along with the total length of the fretboard. In other terms, this process is referred to as ‘intonation’ and is a very important part of getting your guitar set up for a perfect performance. Some bridges will allow you to adjust the height of your strings, which will affect how easy/difficult it is to fret your strings; this process is referred to as the guitar’s ‘action’. There are some bridges out there that allow musicians to initiate vibrato into their playing by using a vibrato arm (whammy bar) to move the bridge of the guitar up and down. Bridges that allow musicians to do this are called tremolo bridges. Now, a tremolo system provides musicians with the ability to move the bridge back and forth (side to side) to adjust the pitching of the notes being played. A bridge that allows musicians to complete this action is referred to as a ‘floating bridge’ and is commonly found on a lot of electric guitars. Most floating bridges feature locking tuning systems, but not all floating bridges have locking tuning systems as some are targeted to be more beginner-friendly. In a string through body bridge-tailpiece, the strings of a guitar are run over the saddles of the bridge and placed through holes that run from the top of the guitar to the back of the guitar, where the strings are then attached to the guitar with metal ferrules. This helps to give the guitar a cleaner appearance, but also does help to increase the sustain of the guitar. The fulcrum vibrato bridge-tailpiece is also referred to as a two-point rocking tremolo, sports individual string saddles that can be adjusted for height and intonation. These saddles are assembled on top of a bridge that rocks back and forth on two bolts that are mounted on top of the guitar. The bridge itself has a wide perpendicular plate that runs through the body of the guitar. The free-floating plate is then attached to the inside of the guitar body with springs that match the tension of your guitar strings. In order to help keep the tuning of the strings more stable, locking tuners clamp down on the strings. The six-point rocking tremolo was introduced to the world by Fender in the 50s. The six-point tremolo is similar to the two-point tremolo in terms of it being through-body, spring loaded, and providing the string with height adjustment and individual intonation. Some musicians enjoy using a six-point rocking tremolo versus a two-point tremolo because the six-string tremolo help to increase the vibration transfer, which leads to an increased resonance. The locking vibrato is similar to the fulcrum vibrato, as it provides musicians with the ability to individually adjust the intonation and height of the strings. The locking vibrato rocks back and forth on top of the guitar and is spring loaded, but instead of clamping down on the strings in one spot, the locking vibrato clamps down on the strings at both the nut and the bridge. 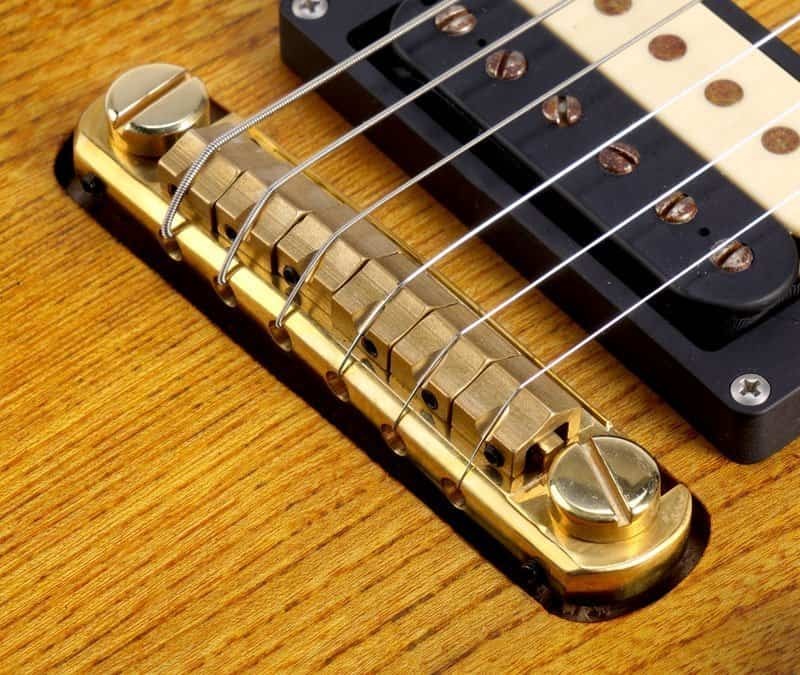 The Tune-o-matic bridge was created by Gibson in the 50s, but is the most commonly found bridge-tailpiece system that you will find on electric guitars today. The Tune-o-matic allows overall adjustment of the string height and the individual intonation of strings to be adjusted. The Bigsby can be found on a lot of vintage-style guitars, but this spring-loaded vibrato is a pretty hefty device. Bigsby operates included a rotating bar that all of the strings of the guitar are attached to. The Trapeze tailpiece is most commonly found on hollow body guitars, but especially so on vintage hollow body guitars. The strings of the guitar attach to the tail of the guitar, which frees the top of the guitar from all of the tension that is brought on by the strings. Simply put, the term ‘scale length’ pertains to the length of the string that vibrations; scale length is measured from the bridge to the nut. A longer scale length means you will notice a tighter feel in the string tension, with a well-defined low end and a brightness to your sound. 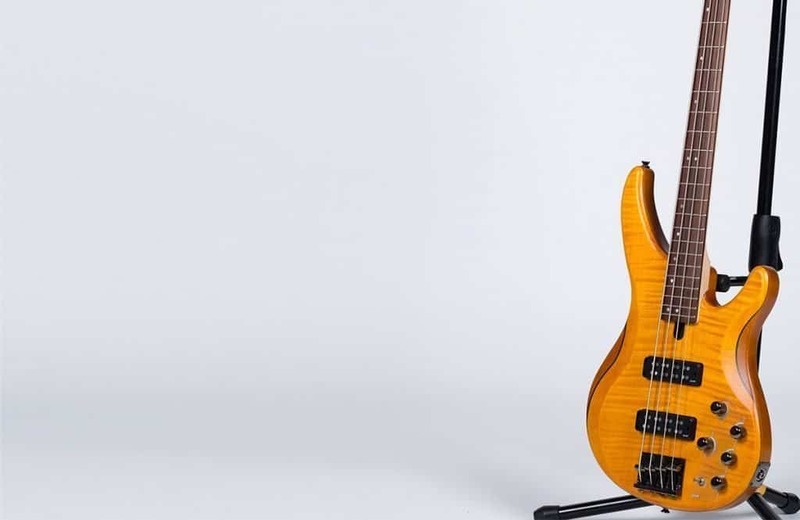 On the opposite end, a short scale length doesn’t provide as much tension, which means that it’s a lot easier to perform string bending and shorter scale lengths are easier to play for people with smaller hands, but produces a warmer tone. 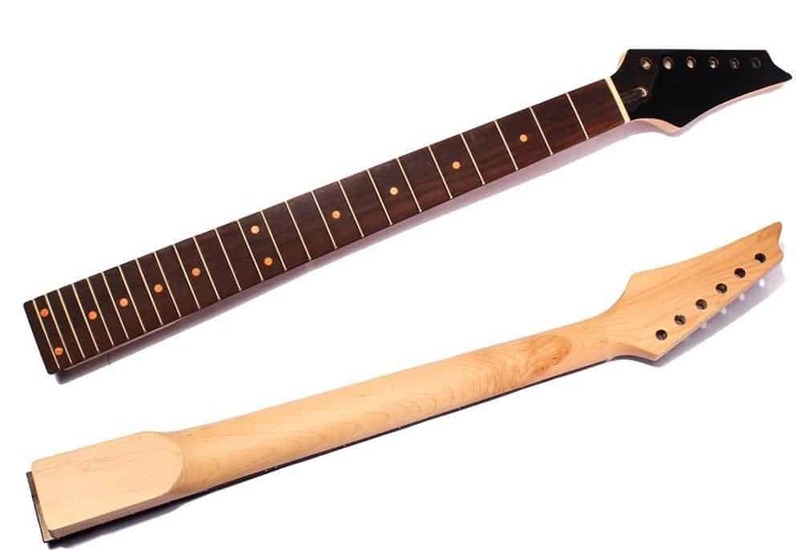 The neck of the guitar is the part of the instrument that stretches out from the body of the guitar; the neck of the guitar holds the fretboard, the headstock, and tuners for the strings. Inside of the neck of the guitar, you will find a metal truss rod that keeps the neck of the guitar from twisting and bowing, but can also be adjusted to create a consistent pitch on the guitar. Fretboards are typically made up of a thin layer of wood (usually ebony or rosewood), although some models of guitars will make the fretboard of the guitar with the same wood that’s used on the neck of the guitar. The majority of all fretboards have inlays or position dots on them, acting as a guide for you to determine your finger positioning while you’re playing. As for as the profile of the necks on a guitar, most guitar necks are either ‘C’ shaped or ‘U’ shaped. Musicians who have smaller hands should look for guitars that have shallow and narrow necks, whereas musicians who have larger hands will find it more comfortable to play on necks that are thicker and wider. Below, you will find a list of the most commonly found woods for neck construction. Just as a quick note, the term ‘hard wood’ describes the tightness of the wood grain, as well as the weight of the wood, which are both extremely important factors when determining the balance of a guitar. Ebony- Hard wood, with smooth feeling and decent sustain. What is a neck joint? Neck through body neck attachments are exclusive to solid-body guitars, as the neck is literally part of the guitar’s body and doesn’t detach through the entire length of the guitar. Neck through body instruments are best known for playing well in high-volume situations, as they help to encourage a well-defined lower end. Set necks are also referred to as set-in necks, but all the term ‘set neck’ means is that the neck is glued into place. Set necks are commonly found with acoustic guitar, but Gibson Les Paul models are a popular electric guitar model that features a set neck. Set necks are thoroughly cut to ensure that it perfectly matches the point on the body of the guitar, while the body and the neck of the guitar are usually connected with dove-tail joints to minimize neck wiggling. Most solid body electric guitars have bolt-on necks, but the bolt-on neck design simply works by attaching the neck of the guitar by a bolt that can be found on the inside of the guitar. What is a neck profile? Above, we briefly touched on the ‘U’ or ‘C’ shaped neck profile or neck shape and which shape was the best for people with small/large hands to hold. The profile on the neck of a guitar is the most personal part of a guitar, as this is where your hand are going to be the most time and energy. The shape of the neck will affect how easily you hold the guitar, how your fingers fit the neck, how tired your hand gets while playing, and how easily your hand can move from fret to fret. Most acoustic guitars have a ‘C’ shaped neck, as the ‘C’ shape is the most universal for all hand sizes to hold. The ‘U’ shaped profile is a little more rectangular shaped neck than the ‘C’ shape and is commonly found on Fender guitars. ‘U’ shaped profiles are the most comfortable for musicians who have long fingers. Lastly, you have ‘V’ shaped profiles which have a groove that runs down the middle of the neck, to provide a comfortable groove for you to grip. Less commonly found is the ‘Inverted V’ neck profile, which is thicker shaped on the bass side and thinner on the treble side, but ‘Inverted V’ necks aren’t very commonly found. When going to purchase an electric guitar, take a look at these points to ensure that the guitar you’re getting ready to purchase is the best for your personal style and taste. If you’re looking for loud amplification, solid body guitars are the way you’re going to want to go. Semi-hollow body guitars are a great choice to make if you’re wanting a guitar that is capable of producing a more acoustic sound, but has the ability to produce large amounts of volume when needed. Hollow body guitars provide users with an acoustic sound, but tend to have high-levels of feedback. The choice of tone wood that you go with when picking out your guitar will affect the weight and tone of your guitar, but that doesn’t mean you should invest in the most expensive tone wood available to get the best sounding guitar possible. Invest your money in an instrument that you enjoy the sound of, instead of just focusing on the pricing of the tone woods. Make sure to look at what type of shape your guitar’s neck is, as it’s especially important that you match up a guitar shape with the size of your hand. The scale length of a guitar will impact the tonal quality of the guitar and the tension of the strings, which therefore will influence the pitch/pitches of your strings. The scale length is referring to the vibrating length of a string and the distance is measured between the bridge and the nut. 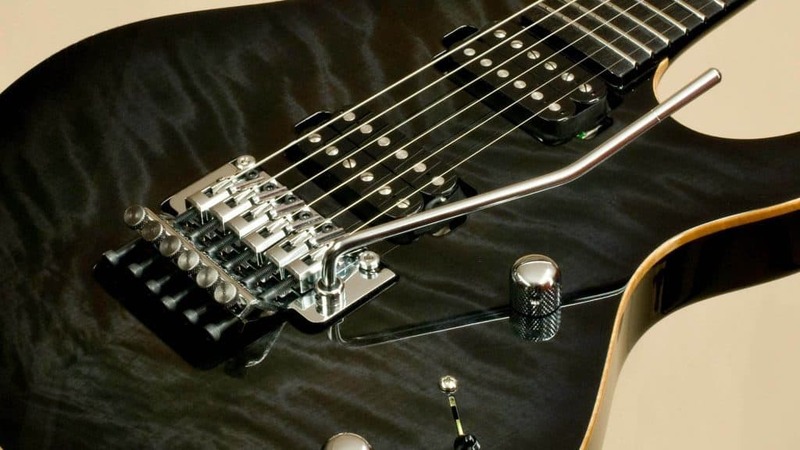 There are two types of different bridges available in the guitar world, stoptail bridges and tremolo bridges. The tremolo bridge (also known as a whammy bar) allows a guitarist to bend all of the strings on the guitar at once, which is popular in rock music, but bending your strings too often can quickly make your strings go out of tune. On the other hand, the stoptail bridge is a lot more stable and provides better sustain than a tremolo bridge does. The finish on your guitar doesn’t have any effect on the sound or tonal quality of your guitar, but it does make your instrument look nice! If you’re not really someone who is too worried about the physical appearance of your guitar, the finish of your instrument isn’t really going to matter too much to you. On the other hand, if you are super interested in the beauty aspect of your guitar, there are tons of different finished out there for you to choose from, so you can get creative! You will find that most guitars feature two pickups, with one pickup located close to eh near (providing a heavier, thicker sound) and the other pickup being close to the bridge of the guitar (highlighting the treble of the guitar). You will also find that most guitars feature a three-way position switch that will give you the option to choose between two of the pickups or a blend of the two together. It isn’t entirely uncommon that you find a five-way switch on a guitar, which will blend the pickups and change their phases to create a glass tone. If your guitar doesn’t come quality tuning pes, you can always upgrade to higher quality tuning pegs at a later date. 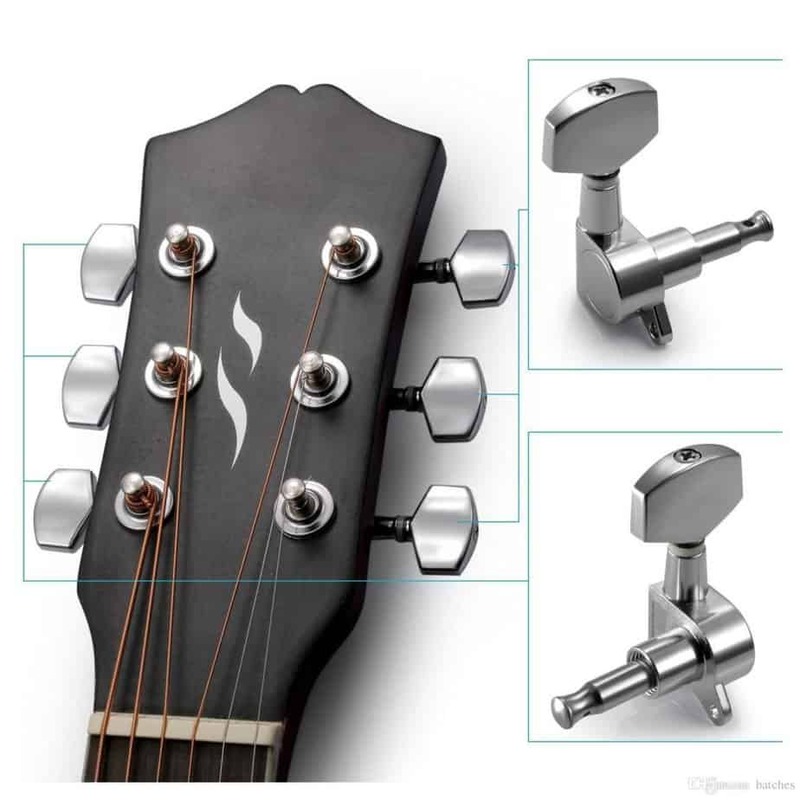 High-quality tuning pegs are what will hold your guitar’s tuning for a long period of time and ensure that the tuning that you achieve doesn’t require as much effort to maintain on a consistent basis. What electric guitar should you buy? At the end of the day, you should choose an electric guitar that best suits your needs (or the needs of the person that you’re shopping for). Your hunt for an electric guitar shouldn’t be one that only takes a quick search on Amazon and a couple of minutes to complete, as you really want to make sure that you’re properly researching every aspect of the guitar you’re interested in to make sure that it’s the best guitar for your needs, before committing to an investment. Hopefully, after reading this article you have a better understanding of all of the different parts of a guitar that you should look at before buying, as well as an understanding of what type of guitar would make the best instrument for your needs. Good luck on your electric guitar shopping adventure! Copyright text 2019 by Guitar Space.